I’ve spoken with many fellow travelers who have been rather blunt in their dislike for this ‘dirty city’, however as you know, travel is subjective and our experiences of it are affected and influenced by a host of events. While it is no secret that the island of Zanzibar is not my favorite place on earth, I found Stone Town to be fascinating and even beautiful in its grittiness. Stone Town is a Swahili coastal trading town, which used to be the old part of Zanzibar city. It is a bustling, living, breathing urban center which has succeeded in keeping its indigenous elements intact. It is a place where African, Arab, Indian and European cultures melt together in a messy and unrefined patchwork of colors, shapes, architecture and people. As you explore the snaking streets, suggestive of a Moroccan Medina, you will find that the majority of the buildings are made in coralline ragstone and mangrove timber, with a plaster and lime-wash finish. The typical Zanzibarian home is a two storied structure with long, narrow rooms which open up to a central courtyard reached through narrow corridors and flanked by the famous, Zanzibar-carved double doors. Teak and rosewood carved balconies, reminiscent of the Indian elite can be seen adorning many of the buildings in the old town center. According to one of my favorite local guides, balconies were later forbidden on many buildings, as they were attributed to Princess Salme’s (infamous princess of Zanzibar and Oman) downfall. Rumor has it that the proximity of her neighbor’s balcony lent itself well to the princess becoming perhaps a bit too acquainted with the German merchant living next door. After becoming pregnant with his child, she later fled to Britain on a cargo ship, married the merchant and converted to Christianity. Regardless of what one believes concerning the balconies, they are in their own right deserving of our admiration. If you’re looking for a place to stay in Stone Town, I would highly recommend the Zanzibar Coffee House http://www.riftvalley-zanzibar.com/. The coffee house is located in one of the oldest buildings in Zanzibar, constructed by the Wazir to Sultan Said Bargash in 1885. The home is charming and magical, filled with unique and tasteful antique furnishings and Arabic motifs. Vintage coffee making gadgets and accessories can be found sprinkled throughout the premise and during the day, the scent of freshly roasted coffee beans permeates the warm air. It is pure bliss. Downstairs is home to the Zanzibar Coffee House Café, which serves up tasty cakes and small plates. I’m partial to their spiced coffee which is perfectly seasoned with just the right amount of cardamom and cinnamon. All of the coffee is grown by the hotel’s owners on farms in Zanzibar and in the Southern highlands of Tanzania. The café is a great hiding place if you want to get away from the craziness of the streets outside. Wi-Fi is good and the staff are incredibly friendly. The best part about this place, in my opinion at least, is the rooftop terrace where complimentary breakfast is served every morning. 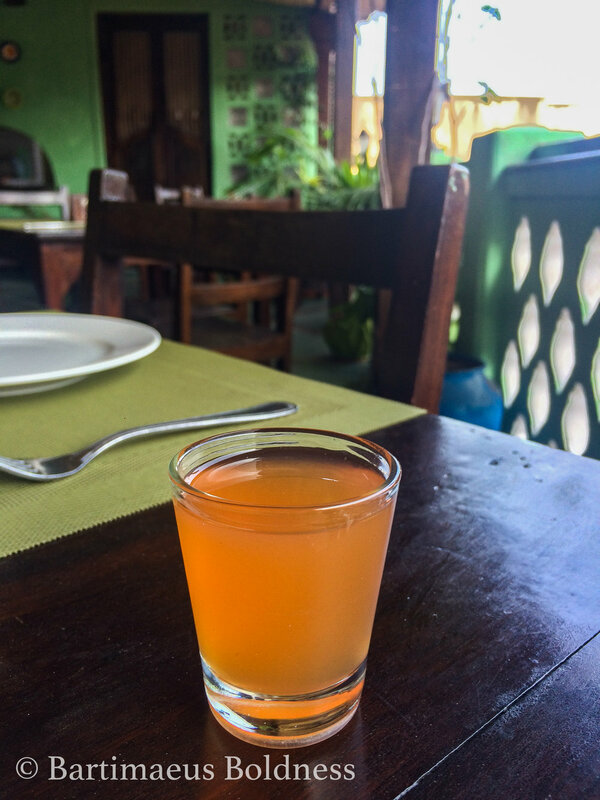 Think freshly made mango-cardamom juice, crepes with cinnamon-orange butter spread, omelettes with locally grown veggies and herbs and of course fresh fruit. While it can get quite windy on the island, there is both outdoor and sheltered seating, thus regardless of the weather one can still enjoy the sweeping views of the historic town, a city full of color and grit. Here time stops. As I sat on the Moroccan-motif pillows, cradling a warm espresso between my hands, I remember gazing out upon the minarets and the clothes hanging to dry, taking in the sounds of the city below and pausing to breathe in the sweet yet pungent ketoacidotic aroma of a city in motion. View from the Coffee House rooftop terrace. Located near the former slave market, this local favorite serves cafeteria-style dishes. The portions are large and the prices can't be beat! My favorites were the flat bread, pilau and octopus coconut curry. Go expecting to make friends as the seating is family style and the staff super friendly. I include the Swahili House as it is just around the corner from the Coffee House and has a beautiful rooftop dining terrace where one can listen to the call of prayer as it resounds over the sun saturated city. The cuisine is Pan-African-international. All ingredients are locally sourced, plus this is one of the few places where I found decent happy hour drink specials. Although I did not have the time to visit this Zanzibar legend, I have it on good record that this is the place to go for outstanding sunset cocktails and gourmet, Swahili and Persian-inspired seafood dishes. Located just across the street from the Zanizibar Coffee House, the restaurant makes its home in a beautifully restored merchant's mansion. The rooftop terrace and tea house was also one of the pit stops in this season's Amazing Race. Conveniently located around the corner from the Coffee House, this restaurant occupies one of the terraces of a three-story 18th century mansion, which once served as the packaging and distribution center for the island's spice trade. The cuisine is international with a mediteranean flair. Best of all is their homeade spice-infused apertif. When I asked my waiter for the recipe he gave me a mischevious smile and told me that it was classified. It took a great deal of restraint to drink only one. And don't forget the Zanzibar Coffee House and Forhodoni Gardens, previously mentioned. The historic center is quite small and most of the major sites can easily be covered in one day. If you are lucky to have longer however, there is much more that the city can offer. If you’re into photography and like to walk, I recommend aimlessly wandering through the maze like streets either very early in the am or just as the sun is setting. For females traveling alone, be aware that creepers, connivers and ‘let’s make a dealers’ are lurking behind every corner. My walks during the early morning hours were my only times free of constant harassment and thus I grew to cherish them. Leaves adorn the Shakti Hindu Temple. Spend an evening hanging out along the pier just beside Forhodoni gardens. Here, as the sun sets behind the crystal blue water, boys and men; young and old, wearing nothing but their swim trunks form a line and when they’re good and ready, one by one make a mad dash straight for the old stone retaining wall, pausing just long enough to lithely jump onto the top of the wall before making their plunge into the trash-littered water below. There is an unspoken rhythm between them, as they cannonball, flail, swan dive, or backflip one after the other into the waiting ocean. While I regretfully did not have my camera with me to capture the sea wall dives, here are some photos taken alongside the waterfront. Make sure to bring cash, finely-tuned bargaining skills, a poker face and an adventurous palette. I recommend a slice of Zanzibar pizza (see my last blog), fried sea urchin on a stick, urojo (soup with potato balls), pilau (spiced rice) and chipsi mayai (omelette with French fries). This should all be washed down with a glass of fresh-pressed, lime-infused sugarcane juice. Forhodoni prepares for the night market. Find the market stalls with the longest lines as the rumor from many a local is that much of the seafood is not nearly as fresh as the vendors tout it to be and speaking from personal experience, coming down with Typhoid in Zanzibar is less than ideal. Be alert to scams, particularly if you are approached by a ‘vendor’ offering to bring a beer and food right to where you are sitting. Not only is it illegal to sell and drink alcohol in the park, but your beer, not so covertly disguised in a paper bag will also come with a $10 price tag. The oldest building in Zanzibar, built around 1700 is the Old Fort. The site served not only as a defense against the Portuguese but was also a church and later a prison with executions on site. The area now hosts a lively market comprised of artist galleries and workshops, a quaint café, an open air theatre and a smattering of local vendors trying to make a living. Be warned, these vendors can be aggressive. One woman actually came up to me on the street insisting to show me around the town with her ulterior motive of course being to lead me somewhat indirectly to her shop in the old fort. Sometimes you just have to roll with it. One of the world’s last open slave markets, the site was closed by the British only in 1873. Slaves were shipped by the thousands from the mainland in handmade Dhows. Visitors can still see sections of the original slave quarters, which give you an almost immediate sense of claustophobia. It is hard to imagine that these quarters once held hundreds of slaves; an undeniably dark and sinister part of our history. Today, the Anglican Cathedral Church of Christ stands at the same location as the original 'whipping tree'. Today the area is marked at the altar by a white marble circle surrounded by red to symbolize the blood of the slaves. Inside the church is a tribute to David Livingstone who stayed in Zanzibar before his final expedition. Upon the alter is a small cross made from the wood of the tree in Zambia under which his heart is buried. Outside, an artist has constructed life-size statues of slaves bearing their original chains. Like many historical sites around the world having been marred by death and destruction, the slave quarters are now eclipsed by the massive Anglican church. While on one level, I understand the symbolism, a large part of me wishes that we could just leave things alone, unmolested by religion and time, a memory left for future humans to witness in its unadorned brokenness. Anglican Cathedral Church of Christ. I LOVE doors, so this for me was one of my Stone Town favorites! The doors found here are more than just doors. They are massive and ornate, Burmese and later East African teak-carved masterpieces which tell the stories of the families who once lived behind them. They speak to the social status, religion and profession of their inhabitants. The Indian doors are marked by beautiful brass studs, which were originally placed to protect against Elephants. Many of these doors are divided up into smaller sections and often have shutters and an arched top frame. The Arab doors are rectangular with intricately delicate frames and Arabic inscriptions often citing the Quran. The Swahili doors are the most modest of the bunch, solid wood structures free of much adornment. You may know this market from the leg of this last season’s amazing race where ‘contestants’ in their ignorance were wheeled and dealed into paying exorbitant prices for everyday items like bananas and matches. Navigating these market stalls requires some business savvy and an ability to stand your ground. If you’re sensitive to smells, this may not be the place for you, however, if you’re like me and thrive on these bedlam-like convergences of humanity, this place is not to be missed. This can be visited on your own or as part of a guided historical walking tour. Be warned that depending upon your tour guide, you may be forced to stop at literally every painting and plaque. By the time I had finished the tour I had seen 40+ paintings of the princess and of the various sultans, which had ruled the area. Unfortunately, the displays are in in need of desperate renovation and repair. It sadly seems that very little money has been put into the upkeep of many of the historical sites in Stone Town. Despite these shortcomings, I recommend a visit to this place for the full package, which includes an opportunity to learn about the characters and historical importance of the area in addition to an upper balcony with sweeping views of the harbor and ocean. I cannot say enough good things about this place. This is your go to place for massages, scrubs, facials, mani/pedis, henna treatments and local, organic beauty products. All of the ingredients are locally sourced, the women who run the place are fabulous and the spa supports a livelihoods project for 10+ Zanzibari families. If spa treatments are not your thing, they also offer a number of workshops, including spice blending, batik fabric painting, Zanzibari cooking, soap and scrub making, incense workshops and music, dance and Tingatinga painting lessons. Sadly, I did not have my camera on hand when I ventured into this beautiful place, so you will have to take me at my word. This local business deserves a visit, or two, or three. 10. Share a hookah and a beer with a friend or make a new friend on the balcony of the Africa House Hotel, outdated and funky but a Stone Town legend with beautiful views. Don’t be confused as I was. You cannot actually visit this place. Much of the interior has caved in and the building is currently off limits. The biggest and tallest building in Zanzibar, a former palace, is historically significant for being the first house in Zanzibar to have electricity and the first house in East Africa to have an elevator. Today visitors may admire the decaying structure from the surrounding fence but be warned that if you linger too long you will be plucked up by a local ‘entrepreneur’. I found this to be highly overrated. It seems that much could be done to commemorate the life of this rock legend, however there is really nothing to be seen other than this sign. I also found the baths to be underwhelming. If you have some extra time, you can hire a guide to take you through these ancient baths, but really there is not much to look at, especially if you have had the fortunate of exploring their counterpart say in Morocco or Turkey. Regardless of what you have read or haven’t read about Stone town, for the right type of ‘tourist’, it is well worth the visit. As with all travel, you must bring with you a sense of adventure, an openness and genuine desire to learn from and connect with the locals. You must be able to roll with the punches and cannot take yourself too seriously, however at the same time you must be street-smart savvy and will need to put on the ‘take no nonsense’ hat. If not, you may find yourself frustrated and exhausted.